The Substitute is like someone opened a window and delicious fresh air came in to revive the slowly stagnating show. Yeah, I know that was very flowery, but seriously, this episode was desperately needed. It was a return of the Glee of old. The basic plot is Principal Figgins gets sick, thanks to a particularly "virulent strain of monkey flu," allowing Sue to use the extremely broad clauses in her contract to get herself into the Principal's seat. 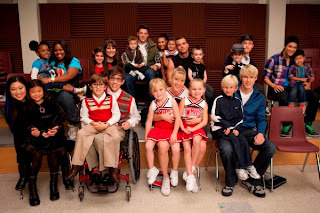 Will ends up getting sick himself, and after hallucinating the Glee club as children, he goes home sick, leaving the club to fend for themselves. Naturally, Rachel tries to take over, and Kurt, in an attempt to stop this, gets the popular substitute teacher, Holly Holiday, to take over Mr. Shue's Glee duties. Everyone, including Sue Sylvester, falls in love with Holly Holiday, played with perfection by Gwyneth Paltrow. Everyone that is except Will, who ends up losing his job to Holly, because Sue just really hates him and his beautiful hair. However, it quickly becomes apparent that Holly is out of her depths because she is not used to dealing with the hard stuff, so Will gets his job back pretty quickly, and also learns how to loosen up a little bit with the Glee club. That's the A-plot. The B-plots involve Mercedes feeling left out as Kurt pursues his new friendship with Blaine and as a way to deal, stages a Norma Rae type of protest when Principal Sue decides to ban tater tots. 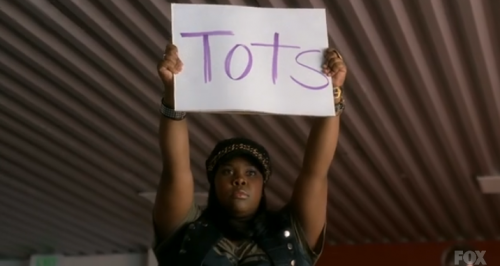 What I want to know is who in their right minds would ban tater tots?! They're tiny and delicious. The other more interesting plot is while Will is very sick he turns to his ex-wife, Terri, for tender, loving care. They have an interesting exchange about how Terri preferred Will while he was weak, and Terri doesn't disagree. In fact, she agrees with him and reveals she's been going to therapy and taking meds. Will is initially a jerk to Terri because he didn't really want her there, but after she gave him his favorite sick movie to watch, he soften up and was much nicer to her, which unfortunately led to the "tender and loving" part of the care. He knows it was a mistake but Terri takes it as a sign they were getting back together, and when Will rejects her (in front of Holly), she gets pissed. Very pissed. Like you know she's going to do something messed up pissed. Kudos to Jessalyn Gilsig! She doesn't get nearly enough credit for playing Terri. Terri is an anxious, manipulative, crazy, vindictive, insecure, unsure, yet oddly caring person. She has so many layers, most of them awful, yet Jessalyn manages to give her some likability. That's extremely hard to do. Anyway, one can't help but feel that Terri will be back soon to cause many more problems for Will, and I can't wait to see how she does it. Now let's talked Gwyneth and the music. There was a lot of concern and confusion when word about Paltrow's involvement hit the news. For some reason, a lot of people seem to dislike her and didn't know if she could sing. I won't touch the first part other to say I've never had a problem with her, but I was excited to hear her sing. I've known for a long time she had pipes because she did that odd movie, Duets, with her father, Bruce Paltrow, some years ago and showed off how well she could sing. Many people will probably agree that this is a career highlight for Gwyneth because not only was she great as Holly Holiday, but she also managed to sway some of the haters into liking her. She really owned the role. I can't wait for when she comes back. The music was stellar for this episode. There's a great song and dance scene with Matt Morrison and Harry Shum, Jr. to "Make 'Em Laugh" from Singin' in the Rain. But it was Gwyneth who stole the show. They made her work! She covers (too briefly) "Conjunction Junction" from Schoolhouse Rock, does "Nowadays/Hot Honey Rag" from Chicago with Lea Michele, a fantastic mash-up of Rihanna's "Umbrella" and "Singin' in the Rain" with Matt and the cast, but the standout performance goes to her rendition of Cee-Lo Green's "Forget You." Yes, it's the clean version, but that doesn't matter because it's so awesome you can't help but play it over and over again. It's gotten such good reviews, Cee-Lo and Gwyneth are going to be recording a new version of it. If there's a Glee song worth buying, it's this one. This was one of the strongest episodes to date. The bullying of Kurt was not forgotten, there was a scene between him and Karofsky where he threatened Kurt's life if he told anyone about the kiss, but it took a backseat to everything else. It was a good thing because it set us up for the next episode and it gave us a break from how heavy the show had become. This is probably my favorite episode of season two so far. We'll see how the rest of the season goes. Til then... here's Gwyneth Paltrow and the cast of Glee with Cee-Lo Green's "Forget You." Adieu! 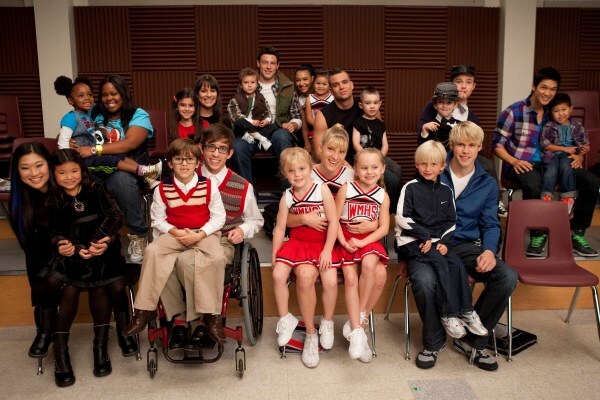 Check out all of our GLEE reviews here!